…that masked the fact that feminism was in no way a challenge or a threat to capitalist patriarchy. This is among the concluding statements to bell hooks’s 1981 text Ain’t I a Woman, which takes the question asked by Sojourner Truth in front of a group of white feminists in 1851. By asking this question, but also coupling that question with specific evidence based in ontological thinking as opposed of prescriptive or descriptive discussions of attributes, qualities, and behaviors (that is: being a woman as a state of being, not as adherence to a set of features, especially behavioral) while also showing her breasts to prove, in fact, that she is a woman Sojourner Truth challenged multiple layers of the “Woman Question” that centered the discussion solely on white women–especially white women of means. This text by bell hooks reasserts this question, along with the limitations inherent to that question and ways of understanding being a woman, in 1981 to lay out the bedrock for intersectional discussions. So, there are multiple ways to approach this text. First, it’s important to acknowledge that the book is 40 years old (almost), and that it was written both in and outside academic circles. In addition, the approach and methodology in the book is interdisciplinary. It’s a textual analysis, it’s a historical analysis, and it’s a critical analysis of a field (or set of fields) and written primarily as literary scholarship. It begins by telling some of the historical origins of how Black women have been treated, named, defined, included, and excluded in American history, literature and culture. It goes from there to further develop how those definitions evolved/devolved into the late 19th century and into the 20th century. 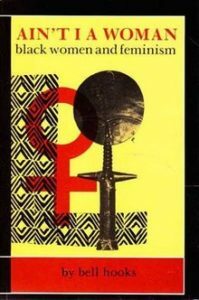 It then spends specific time with the development of feminist theory and feminist thought, always weaving back into this history the roles of Black women and scholars who included Black women in their discussions of this same history. It then traces the specific history between feminism and racism as they intertwined. It concludes by discussing the role of Black women within feminism and without feminism. This leads to a final summation of the current status, and partly concludes with the statement above, discussing how feminism as it is (overly simplistically) understood is about equality, but not really about equity. She suggests that [white] feminism seeks to become equal with their oppressors in order to have the same kinds of power those oppressors have. Her project implies a liberating philosophy that eradicates the structures of oppression and begins again from the ground up, rather than using the self-same architecture. It shares these qualities with forebears and contemporaries likes Audre Lorde, Alice Walker, Angela Davis, and even someone like John Rawls. Also, there’s a lot of discussion in this book on the overlapping circles of feminism and racism (and feminism and anti-racism) that requires more experience than I have to sort through. I enjoyed considering the ways in which racism is reinforced by feminist thinkers and how misogyny is reinforced within Black communities and among Black intellectuals (for this text, historically), because I do not feel correct or in the right lane to have those discussions, but I am interested by them. There’s a near infinite set of analogs regarding being white and male and having a sexual orientation and a gender and a cis/trans identity, that being allowed in to witness these discussions provides tools to think through the ways in which I analyze in my own life. There’s also a kind of slipperiness to those conversations because things just do not line up equally or evenly. The image I think about is you have a picture you’re trying to make out and there a series of rotating screen overlaying that picture. You can rotate each screen individually but in moving one one way, a different one might move another. Or the ways in which two of these overlap, even with the gaps you could see through individually, they present a veiled or distorted version of that image. The ways in which different layers of privilege interact function like these screens. The tools used here are helpful in trying to work out the original picture at the heart of everything. So. That leads to the question of: what role does this book play now? Actually, a lot as I see it. I am no expert in feminist theory, but I have read a decent amount in grad school and beyond with connected but distinct topics related to Queer Theory, Cultures of Imperialism, political theory, and postmodern/post-structuralist theory. And so given this book’s publication in 1981, the colliding and interacting forces of all these different fields, whether they specifically discussed or influenced one another aside, this book finds itself right in the heart of the theory glut of the early 1980s. And one of the things I’ve noticed about recent methods of discussing political topics in more or less Left spaces in that last ten years is the adoption of models of criticism and theory being applied more frequently (with varying degrees of success) by more amateur and everyday readers (as opposed to academics and their analogues). So this book sounds a LOT like a LOT of the conversations that are being attempted in good faith online in wider array of areas around the internet. This is mostly a good thing. There’s still a lot of issue with precise tools being used too bluntly, and with implications and conclusions being selected for their greater political impact (and feeling more gratified with potential efficacy) than with reasonable conclusions from close analysis. I also think there are two specific issues that readers of bell hooks will run into using this book in conjunction with her role as a public intellectual. The thinking in this book is 40 years old, and there are gaps and erasures to be sure. The book is simply one text out of many that hooks has written — and so the role of Queer and Trans individuals is nonexistent here. In addition, hooks herself has made a variety of comments that are out of sync with 2019 conversations. And so there’s a temptation to remove this book from the conversation without considering its time and place, and how it carefully and fully began the very same conversation that is happening today on these issues. I also think that presents the danger of overspecializing the conversation and controlling it to too fine a degree so that nearly infinitely small pieces become subject to discussion and the larger whole is lost. Those smaller pieces can also become reductive. The last point, and I think this happens a lot in online conversations is to mistake analysis tools for activist tools, without carefully considering the difference. This happens with a lot of Foucault’s books as well. bell hooks has done the heavy lifting with this book, and it remains an essential text still. Share the post "The rhetoric of feminism with its emphasis on resistance, rebellion, and revolution created an illusion of militancy and radicalism…"